Not to be confused with Super Star. Turns Mario/Luigi into Rainbow Mario/Rainbow Luigi. 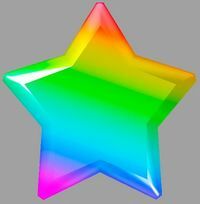 The Rainbow Star is an item that appears in Super Mario Galaxy and Super Mario Galaxy 2; it is the Super Mario Galaxy equivalent of the Super Star, used to prevent confusion between Super Stars and Power Stars. When collected, it transforms Mario into Rainbow Mario (or Luigi into Rainbow Luigi), causing him to become rainbow-colored and leave a trail of light behind him whenever he runs. In this form, he is invincible, can break through certain objects and obstacles (such as Chomps and Boulders), can run faster, and can jump both farther and higher. As the power-up begins to wear off, the music, along with Mario's running speed, will get faster and faster until it wears off completely. The only mission in Super Mario Galaxy where a Rainbow Star is required is The Golden Chomp. The Rainbow Star is the only power-up in Super Mario Galaxy 2 that does not appear as a souvenir in the engine room of Starship Mario. If the player touches another power-up while invincible in Super Mario Galaxy, it flies high into the air. It comes back after a while, however. The music associated with the Rainbow Star is a remix of the music played when Baby Mario acquires a Super Star from Super Mario World 2: Yoshi's Island. This page was last edited on February 23, 2019, at 15:37.